By combining the hours from your schedule (or timesheets) and the pay rates entered for your employee, we're able to forecast your labor costs in real-time while you work on your schedule. 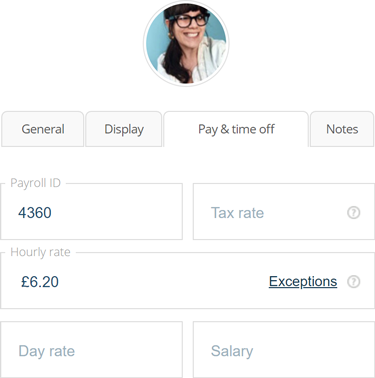 You can enter any combination of hourly rates, day rates, salaries, overtime rates, rate rules (exceptions), ad-hoc rate adjustments, holiday rates, split-shifts, and unpaid breaks. Our reports dashboard gives you a top level view of your team's hours, pay and shifts using more than 40 interactive charts. Find out at a glance who's working the most shifts, who's being paid the most overtime, who's taking the most sick days, and who's working the longest shifts. Using 'real-time reporting', you can display the number of shifts, scheduled hours and estimated pay for each employee on your schedule. We make these calculations hundreds of times a second, so you can watch your costs while you put together your schedule. Enter any combination of hourly rates, day rates and salaries, and we'll take care of the rest. Do your salaried employees receive overtime after exceeding their contracted number of hours each week? Just enter their maximum hours and their overtime rate and we'll work out the rest. Use rules to calculate different hourly rates for employees based on their shift's day of the week, time of the day, facility and the employee's age. Rules will either override employee pay rates with a fixed hourly rate or adjust their normal hourly rate with a multiplier. Do you pay your employees more to work public holidays? 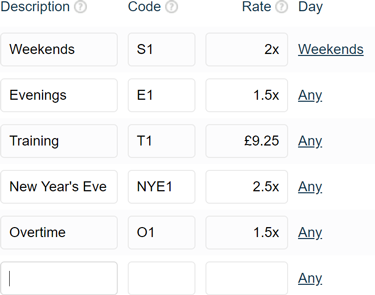 Add a rate multiplier and Findmyshift will automatically adjust their hourly rates. If you don't pay your employees for their breaks you can set up a break-rule, and we'll automatically adjust their payable hours. Need to go back and check how the last month's payroll was calculated? We keep your historical data online and available at all times, just in case.